With a number of articles, journals and research findings getting published by different companies about the upcoming marketing trends and best practices, it has become a challenge for marketing leaders to sieve through it all and determine what exactly they should focus on that can help them generate useful marketing results. 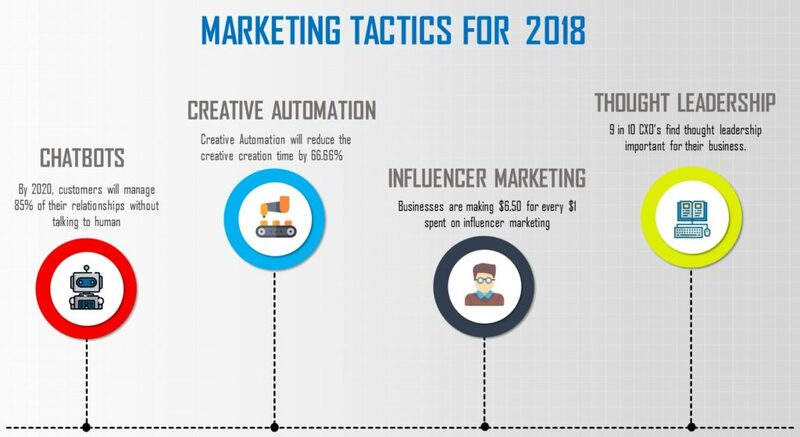 After doing our research and study and after reaching out to a few key influencers in marketing, we bring to you a list of top marketing tactics for 2018 that are not only going to shaping the future of marketing in 2018 but will also be widely used by different organizations to enhance their customer experience. 47% of companies already using an automation system in their CRM integrations. 33% of companies have already implemented automation in their social plan. But this is 2018! There must be something different which is a step above this type of automation. In 2018, the next wave of revolution in the field of automation is Creative Creation Process Automation. Automating the process in which creatives are being created by the agencies through automation software. One would no longer require graphic designers to design their emailers and website banners. Here are two main fun facts about automating the creative creation process. Companies in 2018 will be able to create their own creatives (emailers, banners etc) by simply clicking 3-4 buttons on their software and in 1/3rd of the time that it currently takes to get creative from a creative agency. In the age of bots, the decision is yours…..
Chatbots will be able to provide much deeper insights about the customers through the level of interactions that they will have with them. Chatbots will bring out the brand personality to life – Chatbots will become a “live entity” that will infuse personality into conversations. 3. Influencer marketing: Say hello to INSTAGRAM ! Facebook/Instagram and Youtube emerged as a clear winner for influencer marketing in 2017, with a majority of big brands turning up to these channels for promoting their brand. And in 2018, it is just going to touch new heights. An influencer marketing survey conducted by Collective Bias involving 14,000 respondents in US, reveals this statistic. Facebook and Youtube are the two most preferred channels for influencer marketing with 19% and 18% of consumer purchase decisions being influenced by Facebook posts and Youtube videos. A mere 3% of consumers are influenced by celebrity endorsements in their product purchase decisions. 30% consumers are more likely to buy a product recommended by a non-celebrity blogger. They can relate more to these influencers and value their opinions more than that of celebrity influencers. The trick of the trade to crack influencer is to find the right type of influencer for promoting your product and the right channel. Define your target audience and then choose the desired influencer. According to new research from LinkedIn and Edelman Digital. From the above stats, it must be pretty clear as to how much importance the Thought Leadership holds in the businesses success. 2018 is stated as the year which will be driven by great content so the trick of the trade now is to learn this art and master it. Following things will be seen shaping up the thought leadership sphere. Also read more about the 4p’s of marketing and their importance in forming a marketing strategy.